Ferrari team principal Stefano Domenicali believes it will take time for the impact of its recent technical reshuffle to help deliver improved form on-track. Following a disappointing start to the campaign, Ferrari announced earlier this week that technical director Aldo Costa was stepping down and Pat Fry was to take on more responsibility within the new structure. Domenicali says the changes took place now so that next year's car is designed under the new structure - although he hopes that improvements will be found with the 2011 car too. "When you want to speak about the future development of cars and the future of the organisation, this is a process that takes a very long time," he said during a media briefing in Monaco on Friday. "You cannot think that something like that can have an effect in [just] two days time. "It's a matter of changing the methodology of work and of trying to improve it - that's the objective. Otherwise you don't change. We try to see different priorities in the development of the car. We try to put different concepts on the development of the car and this is why it [the decision] did not happen the day after [Spain], but it is happening over a little time that took a bit longer. "This is why if you want to be effective you need to do it as early as possible, otherwise you will not have an effect on the following season." Domenicali said it had not been easy to make the decision on Costa, having worked with him for a long time, but felt that it was something that needed to be done. "It was a very difficult decision from an emotional point of view," he said. "You can imagine when you have worked with a person for many, many years, you grow up together, and it's not easy. "But sometimes when you take the decision, and you are responsible for the team, you have to take care to be as rational as possible to do the things for the benefit of the team. But as I said it was not easy." 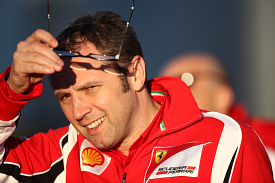 Domenicali made it clear that there were no plans by Ferrari to recruit a high-profile figure to take a major role in the technical department. "For sure it is a priority for the team to make sure that the structure is strong," he said. "We want to have a stable reorganisation, so we are not discussing the first [top] line I would say. But for sure we are looking around, as everyone is doing, to reinforce the different areas, because it is part of the continuous evolution that we need to make sure that this is happening."